SUN TRAFFIC - HELPING YOU TO APPLY FOR TRICKY TEMPORARY TRAFFIC LIGHT LICENCE’S! Here at Sun Traffic Headquarters in beautiful Somerton in Somerset we have over 27 years of Traffic Management experience and our loyal Customers return to us time and time again for all types of Traffic Management provision, our knowledge and expertise is incomparable. Our team in the busy Hire & Sales department can help our customers further by applying for and obtaining Highway Licence’s for Temporary Traffic Lights, including obtaining the necessary Road Space booking on their behalf for a set charge. 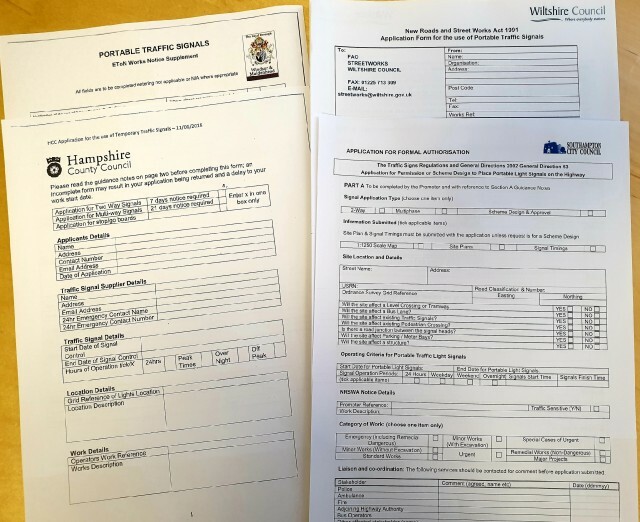 Each Borough Council’s rules differ with these licence applications and once the application has been made various requests can come back before the licence is approved, below are just a few pointers on what type of requests can come up! Our experienced team can help iron out these queries to make sure everything goes as smoothly as possible keeping the red tape away from you! • Councils may request a Site Visit Meeting between the Customer and one of our highly skilled operatives to see what Traffic Management is right for the job and to assess safety. Councils will sometimes ask to attend this meeting too. • A CAD drawing may be required in addition to the normal traffic plan produced by our operative following the Site Visit meeting. This assists both you as the customer and also is necessary for us to send to most Council’s when applying. We can arrange these detailed drawings. • Our Hire and Sales team can check if other Roadworks are planned at the same time as your required dates to avoid any clash with other works. • We can also obtain all Grid Reference’s and Eastings/Northings required by any council with ease. • Some Councils require Special Signs to be produced with information on pertaining to the works or Advanced Warning Signs to go out a week or two before, we can help with this. • Differing Council’s may require an operative to attend with the Traffic Lights and to stay with them each day of the work – we can arrange all this too! (Please note will add an additional charge to your job). • Likewise there may be strict timings to adhere to such as the lights only to be on during peak times or to be set up and removed each day. • We can also offer the service of moving the lights up and down the road during the duration of the work - this is particularly useful for Tree Surgeons who work with us all the time! With depots around the country located in Somerton, Ashley Heath, Godalming, Wantage and Tewkesbury we can ensure that most areas of the UK are covered and in Hire and Sales there is also a wealth of knowledge in assisting and advising customers along with lots of contacts at various Council’s to assist in what’s required by each individual Council. The team will usually need a couple of weeks to apply for a Temporary Traffic Light Licence but with their contacts and expertise in Road Traffic Management and Customer Service they will endeavour to get your licence as quickly as possible! So call us on 0845 1230111 to discuss any of your Traffic Management requirements and let us take the pressure off by applying for the Traffic Light Licence for you! We look forward to your call!